That’s the question I see repeated every week in the world of personal finance and in the FIRE (financial independence retire early) movement. The reality is that far too many marriages are stuck in a game of financial tug-o-war. Pulling, heaving, and running in opposite directions with money in the middle. If you’re trying to become financially independent and your spouse isn’t on board, it can be exhausting. For whatever reason, you and your spouse just can’t seem to get on the same page when it comes to money. Here’s what you need to know… The more time it takes you to get on the same page, the longer you’ll be spinning your wheels. You’ll soon become frustrated at your lack of progress, and over time resentment will slowly creep into your marriage. That’s why it is SO important to have the #FIREtalk today with your spouse. The sooner you can get on the same page, the faster you’ll reach your goals and the happier you will both be. In this post I want to share one, simple question that I truly believe can get you and your spouse on the same path towards Financial Independence. 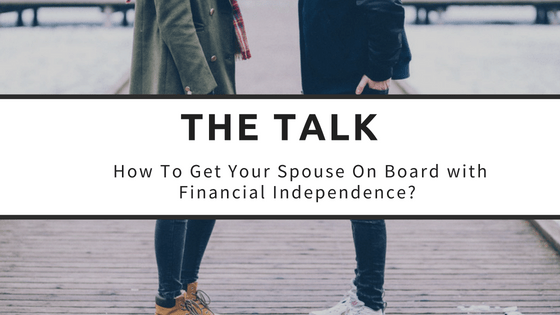 The Talk: How to get your spouse on board with Financial Independence? A few months back I was smoking a cigar with my dad on the back porch. He shared with me that he would be retiring after 40+ years of full-time work. It was an exciting conversation for me! I got to ask him all about his plans for retirement, how he and my mom are going to spend their time, what he’s looking forward to, and what he’s nervous about. Like most people, it was a mix of both. He acknowledged that they probably could have retired a year or two earlier but he was at the peak of his earning potential and a couple more years of work would cement their retirement security as best as possible. It hit me as soon as I asked that question though… This is a GREAT question for people to bring up the idea of FIRE with their spouses. Here’s what I love about this question. It addresses the underlying notion that you must work until you are in your mid 60’s to have enough money to retire. Most people believe that your age and your ability to retire are linked. In fact, most people are so conditioned to fear the impossibility of saving for retirement that the very notion of retiring early seems impossible. This question separates the issues of age and ability. The key here though is you are just asking the question. If you want the conversation to actually be a conversation, then you need to give your spouse the opportunity to come to their own conclusion. After you ask the question, your job is simple. Listen and ask follow-up questions to dig a little deeper. You might be surprised what you learn about their way of thinking. Now how would you handle the three possible responses? First off, congrats to you! If your goal is to retire early or at the very least, then this is probably the ideal response to hear! At the end of the day, the ability to retire is what should matter. The reality is that if you are 62 and don’t have the finances to retire, you won’t be able to, so age is somewhat irrelevant. Now if you’re able to hit that magic number a few years earlier, why wouldn’t you want to have the flexibility to walk away? If you’ve been reading personal finance blogs or listening to FIRE related podcasts, then this concept is familiar to you. It’s the age-old, beaten to death, “opportunity cost of money” concept. However, this idea might be new to your spouse, so you need to give them time. The least helpful thing you can do is force them to make 20+ cost-benefit decisions in one conversation. Work with them to make small tweaks over time and slowly refine your shared financial plan. First, start with the easy wins: Find things to cut and save money on that don’t contribute any value to your life. This might be the starbucks you grab on the way to the office or dropping cable because you hardly have time for TV anyways. Doing these won’t make you millions, but they will get the wheels turning. 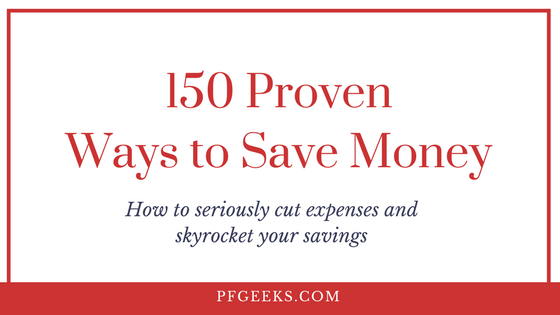 If you’re looking for a place to start, check out my list of 150 Proven Ways to Save Money or get my PDF of 46 Meal Prep Recipes that are all $2 or less per serving! Then, move on to the big wins: The easiest way to really build wealth is to focus on big wins. Housing and transportation are the big ones. If you can find a place to rent that is $100-200 cheaper than your current place, then you don’t need to worry about the $4 lattes. Buy a used, reliable car and you’ll save yourself thousands in depreciation and maintenance. Now, if your spouse responds that they want to retire when they hit a certain age, the best thing you can do is simply dig deeper by asking questions. So if we woke up tomorrow with enough money to retire, would you keep working in your current job for the next 20 years if you didn’t have to? Or are there other ways you’d like to spend your time? If work was optional, what are the hobbies or causes you’d want to spend time supporting? The key here is to get them dreaming and thinking of the possibilities. Once work is no longer required, the opportunities to spend your time are endless. Reaching financial independence doesn’t mean you sit on the couch and watch netflix all day. For many, the ability to no longer be dependent on an employer opens up the door to take on passion projects, spend more time with family, and travel the world. OR! Don’t start a blog and just live your life however you want to. So ask your spouse, “If money wasn’t an object, how would you spend your time? If you’re willing to ask why and then sit back and listen, you just may learn something new about your life partner. Maybe they have a fear about retirement you didn’t know existed or maybe they have concerns about life they’ve never shared with you. This is how the conversation went with my wife. I asked her, “Why 50?” and I never could have guessed what she said. My wife felt like we would have less purpose if we left our careers any earlier than that. Now this is surprising because to her own admission, she never really cared much about having a career, but here she was tying her purpose to her career. Now for one, I was proud of her! I love that she feels a sense of purpose in her work now and I wouldn’t have known about this change in her if I hadn’t been willing to sit back and listen. After identifying any underlying thoughts or concerns, the next step in your conversation is to press the lower limit. If your spouse has a “certain age” in which they think they should retire, then why not bring that timeline up by five years? Ask them how that time could be spent with family, pursuing hobbies, volunteering with causes you both care deeply about. Your life purpose doesn’t have to be tied to where your paycheck comes from. Encourage them to dream bigger than that. Before you take sit down with your spouse to have “the talk,” you need to make sure your attitude is in the right place. If you aren’t careful, you may just push them farther away. When it comes to money & marriage, you don’t want to become manipulative. If you want to get your spouse on board for financial independence then don’t do it by manipulating them. Focus on the life you’ll be able to live and the security you will have together by taking control of your finances. If you’re about to ask your spouse to make big sacrifices like downsizing your living, selling a car, or drastically cutting life expenses, you need to be willing to compromise. If you’re able to cut your spending by $800 a month then don’t worry so much about the occasional starbucks. At the end of the day, your spouse may not be as interested as you are in being able to retire early. Prepare for that to be the case and try to focus on getting some big wins. This is SO key! For those of us who are drinking the “FIRE” kool-aid, it is tempting to dump everything we know on our spouse to get them on board. That won’t work. Your goal in this first conversation is to introduce your partner to the idea of financial independence, not overwhelm them. If you find yourself trying to distill all 80 episodes of the ChooseFI podcast or breaking down all of Early Retirement Now’s withdrawal rate series then you’ve gone too far. Financial independence can lead to whatever you want: total relaxation, life on the beach, travel, more meaningful work, time with family. One mistake people make when trying to get their spouse on board is putting the entire focus on being able to walk away and quit working. For many, that is THE goal, but for your spouse it may seem so far out in left field that it isn’t possible. Start chasing financial independence and decide on the early retirement later. If you know that the ability to retire early is a goal for your spouse, then obviously use that as the motivation! Lastly, as you approach the conversation with your spouse you definitely need to be patient. Odds are, you’ve been soaking up and learning all you can about personal finance for months or maybe even years. You might be frustrated by their lack of interest or care about money. Go into the conversation ready to be patient. Money doesn’t have to be the axe splitting apart your marriage. Take time this week to sit down and talk about your financial goals with your spouse. But whatever you do, don’t sit them down for a lecture–get their input and work together to create a plan for your financial future. Be willing to ask questions, listen carefully, and compromise gracefully. Join me in the comments: What are the 1-2 things that have helped you and your spouse get on the same team with your finances? What advice would you have for newlyweds looking to become financially independent together? Focus on the FI not the RE! That in a nutshell. My husband never wants to have to be 100% retired, but over time he’s seen the huge draw in what financial independence can do for your options of how you live your life. My wife and I have always been pretty frugal so we already had that going for us. However, she thought I was off my rocker when I started talking about the possibility of early retirement. The change though was once we did a “staycation” and she realized how much more time we’d have to spend as a family. From that point, we got more serious on the numbers and are in the middle of pulling the trigger now. Thanks for including me in your post, Rich – very much appreciated! Retiring at an earlier age does come with a significant tax penalty relative to sheltered retirement accounts. You need access to that cash earlier and it is more difficult to amass after-tax dollars. That said, you only need a bridge to the age where you can access them penalty free. I think FI first is the right idea. Freedom is the ticket. You can then retire if it suits you. Totally with you on this! FI is the first goal. There are some ways to access retirement accounts early (Roth ladder). However, I don’t think my wife and I will fully retire from work even once we are financially independent. Goal is to have to have more time to only do work we enjoy. Currently, we both love our jobs.